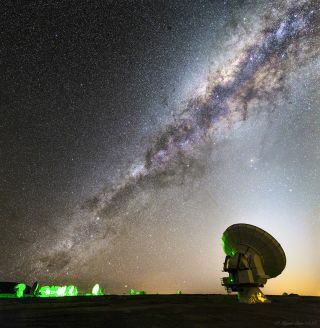 The Milky Way crosses the sky above antenna DV-21 at the Atacama Large Millimeter/submillimeter Array (ALMA), in the Atacama desert in northern Chile. This scene shows the magnificent presence of the Milky Way galaxy, full of nebulous clouds of interstellar gas and dust and sparkling star clusters shining bright in one of the most pristine dark-sky sites in the world. Located 16,500 feet (5,000 meters) above the sea level is the Atacama Large Millimeter/submillimeter Array (ALMA), an astronomical observatory consisting of 66 radio telescopes in the Atacama desert of northern Chile. The 66 antennas that make up ALMA can be relocated across the Atacama desert to form different configurations, with the distance between antennas varying from about 500 feet (150 meters) to 10 miles (16 kilometers), giving ALMA "a powerful variable 'zoom,'" according to the European Southern Observatory's (ESO) description of ALMA. The array thus simulates a giant, single telescope much larger than any that could actually be built. In fact, ALMA has a maximum resolution that is even better than that achieved, at visible wavelengths, by the Hubble Space Telescope. According to ESO, which owns and operates the telescope array, "ALMA is the most powerful telescope for observing the cool universe — molecular gas and dust." It is designed to study "the building blocks of stars, planetary systems, galaxies and life itself," allowing astronomers to address "some of the deepest questions of our cosmic origins." To see more of Claro's amazing astrophotography, visit his website, www.miguelclaro.com. Follow us on Twitter at @Spacedotcom and on Facebook. Original article on Space.com.